Before Red Line trains began whizzing under the streets of Cambridge, before professional baseball existed - let alone Fenway Park, before a single note was played inside Symphony Hall, two yellowwood trees reached into the sky in front of Frist Church in Cambridge, just across from the Common. After a 142 year run, the venerable trees came down. 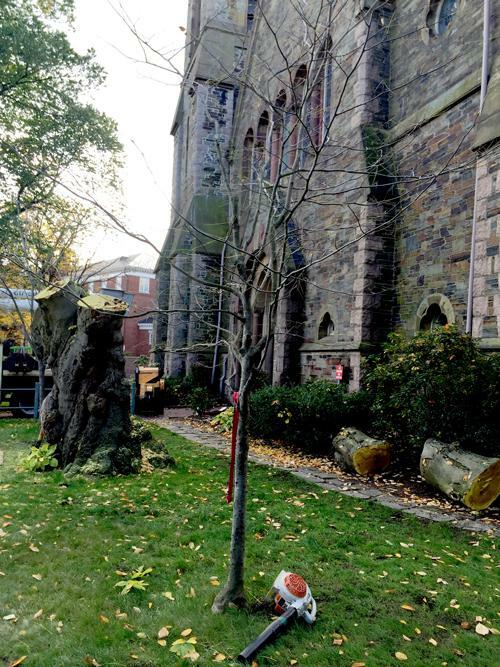 Shortly before 11 o’clock on a Wednesday morning, with a few dozen church leaders, members, and school kids looking on, the chainsaws were fired up and leaf-strewn limbs began falling from the sky onto the lawn in front of First Church of Cambridge. When it became clear that the church’s two majestic yellowwood trees had reached their end, and would have to be removed, First Church senior minister Dan Smith did what he does: He prepared a sermon. "I wanted to give the congregation some context, a heads up to prepare their hearts for this great loss," Smith said. "This is a bittersweet day. It’s a sad day, but its also a day that we can share in the context of a cycle of life and death and rebirth. So I told the story of these trees being planted by Asa Gray, the famous Harvard botanist. Gray, today considered the most important American botanist of the 19th century, was also a deacon at First Church — and a close colleague and proponent of Charles Darwin. As proud as church members are of their trees’ provenance, Smith says it’s a more personal history that resonates with his congregation. "These trees have spanned over three centuries, and parents and grandparents and great-grandparents have watched these trees," he said. Kate Judd was among the church members who attended Smith’s sermon. "After the service we came out here and hugged the trees and blessed the trees and gave our memories of the trees," Judd said. Those fond memories included countless post-church chats, thousands of wedding and baptism photos, even a successful courtship. And it’s not just church members who’ll miss the yellowwoods towering over Garden Street. "Well time passes, you know," said Al Vaughn. "Nature takes its course." Vaughn works at the Sheraton Commander hotel next door. For 14 years, he’s passed the trees every day coming to and from work. "They give us tremendous energy they really do," he said. "They give us spiritual energy that is unsurpassed." The trees’ story doesn’t end here today. Karen Case, a minister at the church, was busy collecting seedpods amidst the falling leaves and branches. "These are yellowwood seeds that we’re going to send to Arnold Arboretum to see if they can propagate some new trees from these same old ones," Case said. They’ll also send seeds to Mt Auburn Cemetery, where Asa Green is buried. As for the trees themselves? "We’re harvesting as much as we can of the trees to make bowls — communion bowls, crosses — to preserve the trees," said Don Johnson, co-chair of First Church’s buildings and grounds committee. And perhaps, most importantly, there will now plenty of light on the lawn for the two saplings planted a few years back to flourish. They are, of course, both yellowwoods.